David Parker has practiced law since 1987. Mr. Parker is a partner at the firm and has a general law practice, handling both civil and criminal cases, with a focus on personal injury, real estate, and estate planning law. He earned his Juris Doctor degree from Georgia State University School of Law in 1987, and his Bachelor‘s degree from Mercer University in 1984. Mr. Parker served as an assistant prosecutor for the State of Georgia in Fulton County in 1987. Thereafter, he went on active duty in the United States Marine Corps and served five years as a Judge Advocate. While serving as a Judge Advocate before, during and after the Gulf War, Mr. Parker handled hundreds of Administrative Hearings and Court Martials. 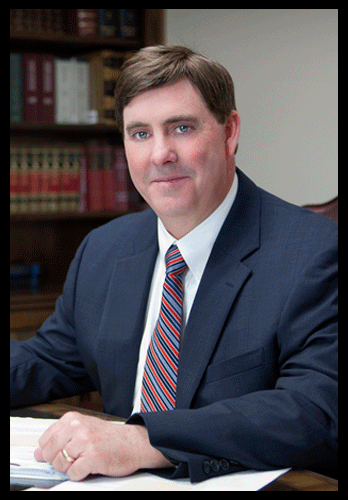 During his tenure as a Judge Advocate, Mr. Parker also taught business law at Coastal Carolina Community College. Following his honorable discharge at the rank of Captain from the United States Marine Corps, Mr. Parker and his wife, Joni, returned to their hometown of Valdosta, Georgia, where he entered the private practice of law. Since that time he has been active in the practice of personal injury law representing clients and obtaining successful verdicts and settlements as high as several million dollars. Mr. Parker represents seriously injured persons in wrongful death cases, automobile and tractor trailer wrecks, playground injuries, and workplace accidents as well as many other types of negligence cases. Mr. Parker also has a very active real estate practice. He has represented buyers, sellers and lenders in both residential and commercial closings, literally handling thousands of purchase and refinance transactions. His experience also includes closings involving HUD and HAP contracts. Mr. Parker’s experience and knowledge in the area of real estate law have resulted in his being asked to serve as counsel for the Valdosta Board of Realtors for the past four years. He also serves as a board member for Attorneys’ Title Guaranty Fund, Inc., a nonprofit organization whose purpose is to establish a better framework by which attorneys in Georgia can guarantee and insure title and interests in real property. Mr. Parker is a frequent lecturer on topics involving real estate and business law. He has also lectured extensively in the area of wills, trusts, & estate planning. In addition to his personal injury practice, Mr. Parker is experienced in estate planning, preparation of trusts, and has prepared wills for hundreds of clients while in military and civilian practice. With his background and experience, Mr. Parker has gained extensive knowledge about the law, business, and dealing with high pressure situations. He can put his experience to work for you. Married to Joni Parker for over twenty-five years and have two children, Holli, who is attending the University of Georgia, and Jeremy who is attending Berry College.